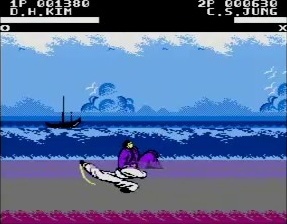 Daou Infosys first got known as an official distributor for some MSX/Zemmix products, and later became the country's major publisher of 8-bit console games under the label Jaem Jaem Club. 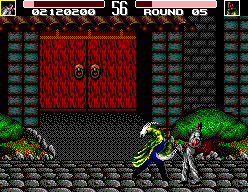 Their internal studio first concentrated on licensed titles, but in early 1993, all game development was outsourced to Open1. 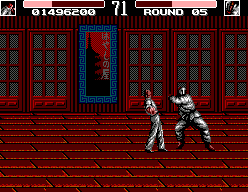 In 1993, Daou made a contract with the North American Innovation, the software publishing division of The Ultimate Games Club, which in the end never released anything2. The deal extended to a whole 10 games, mentioned were Dooly the Dinosaur, Janggun-eui Adeul, Open's Wonder Kid, Koko Adventure and Toto World 3. All games were supposed to be made "suitable" to American tastes3. 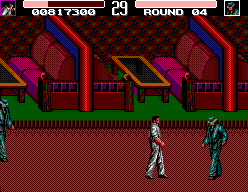 Daou Infosys has been reportedly closed down in 19984, but Jaem Jaem club seems to have ended around 1994, as there have been no more games released under the label afterwards. 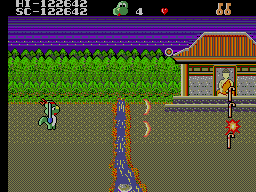 This is the second of many games based on Korea's most popular animation license, Agi Gongryong Dooly. Other than its Master System counterpart, the Zemmix Dooly game is a straightforward run 'n gun, except for the occasional shmup stage. 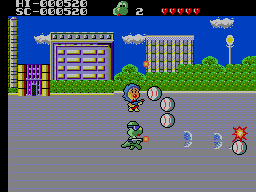 Weapons and powerups are won in a game of rock, paper & scissors. 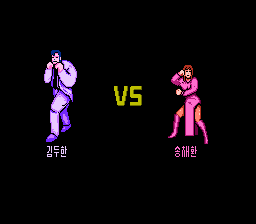 For once the Master System version of a Korean MSX game wasn't a mere conversion, as this is quite a different game from the above one. Whoever is puzzled upon looking at the screenshots, whether this is a shooter or a platformer, hit the nail right on the head: It is a mix of both, though with more weight on the shooter bit. 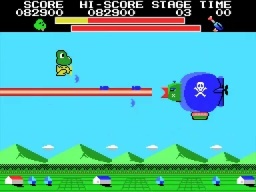 The levels autoscroll from left to right, and Dooly can move in all four directions, but one of the two fire buttons is dedicated to a jump, which is needed for some obstacles. 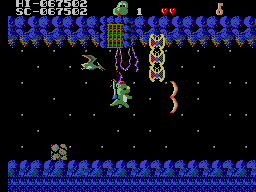 Every stage loops indefinitely until Dooly finds three keys. 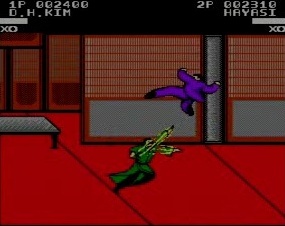 Two are "donated" by defeated enemies, but the last one has to be won once again in a rock-paper-scissors match against a boy (who is also a character in the animated series). 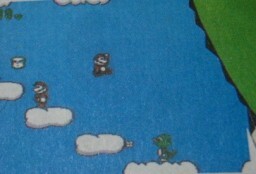 Did the first game by Aproman send the baby dinosaur into space, this time he has to travel through time. 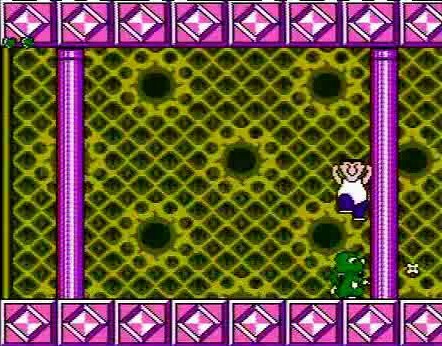 In every period he gets a new outfit and weapon, only towards the end appear power ups that enable him to switch weapons in between. 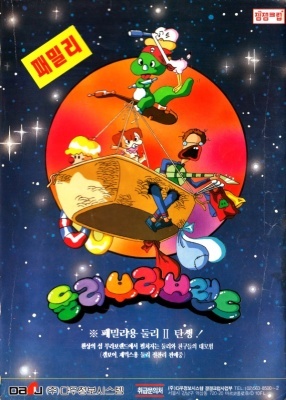 Agi Gongnyong Dooly was one of two games by Daou/Open that are known to have been localized for Innovation's US release, which never happened. 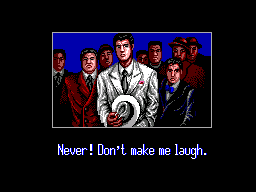 Despite Innovation's general inability to get stuff released, one cannot help but think that the developers stuffing rip-offs of copyrighted music into the localized version had something to do with it. 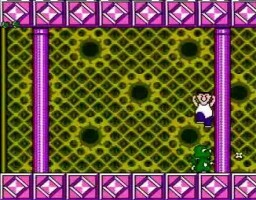 Nothing better than killing tennis balls to the sound of Smeels Like Teen Spirit. 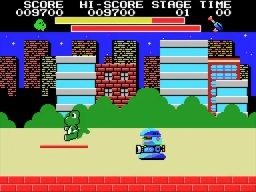 Other songs include Divine Thing by Soup Dragons, Two Princes by Spin Doctor and Everything About You by Ugly Kid Joe. 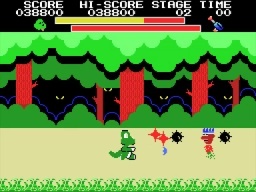 Other than the change in music, a few characters from the series that appear as rotating shields around Dooly, have been replaced with dinosaurs, and of course the Korean screen text has been translated into English. It appears that the "Americanized" version has been sold in Korea, afterwards. 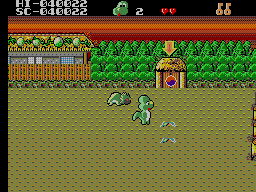 Dooly soon returned in this quasi-sequel, this time a pure platformer set in an amusement park. 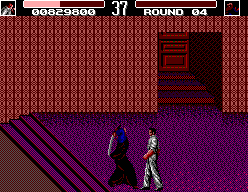 This time the stages can be selected among freely, but every one of them is infamous for its difficulty. 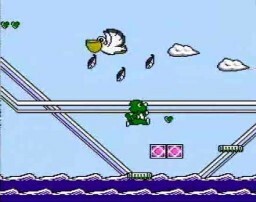 The aggravating controls are said to do their part to make this game Nintendo hard in the most terrible sense of the word. Although the game is completely original in itself, there is one sprite ripped from Super Mario Bros. 3—no one less than Mario himself, who makes a cameo as a standard enemy. 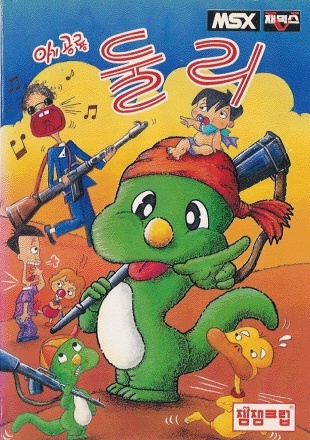 Like most Korean Famicom games, Dooly Bravo Land is extremely rare and hasn't been preserved, yet. 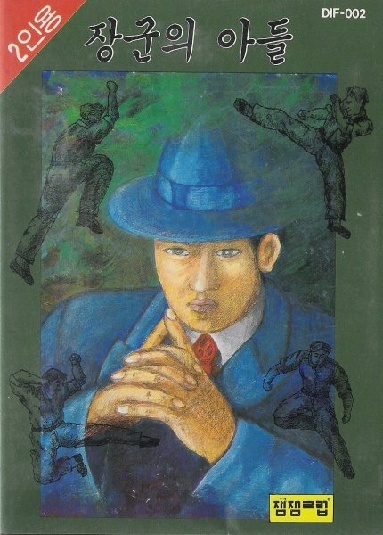 Daou's other license was Janggun-ui Adeul (the official English title for the films is The General's Son), a gangster movie trilogy that could be called the Korean answer to The Godfather, to sum it up in one short sentence. 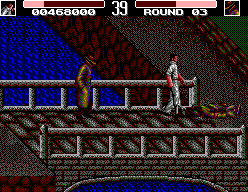 The first game, for the Samsung Gam*boy, is a sidescrolling beat 'em up, following very roughly the main events of the first film, which is set in colonial times at the beginning of the 20th century. 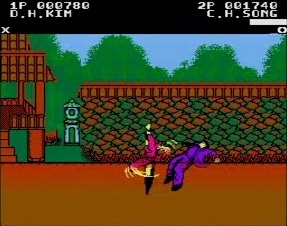 The move repertoire of hero Kim Duhan is very limited, and his walking speed is so slow that it's much faster to jumpkick through the stages. 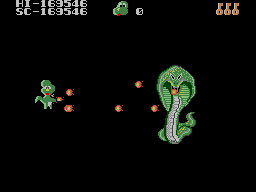 Most enemies don't take more than two or three hits, only the bosses are a bit tougher. 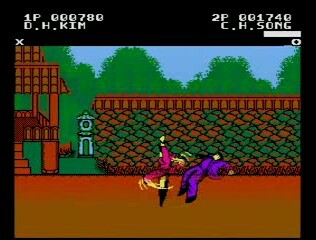 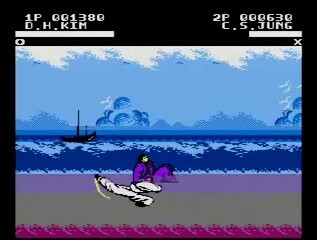 However, the hero is also quite vulnerable, making this game rather hard despite its short length. 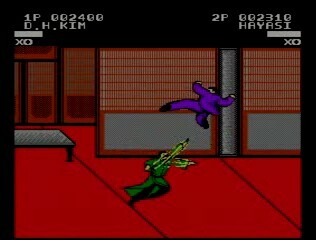 Janggun-ui Adeul was renamed Street Hero and converted to a Game Gear cartridge for a US release by Innovation. 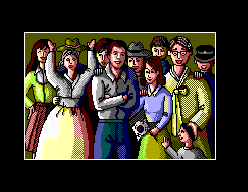 The ad makes it look like the whole setting would have been switched to a modern day scenario, but actually only the intro text got changed. 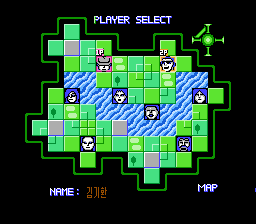 It remained unreleased like all Innovation games, but prototypes of this version exist and have been preserved. 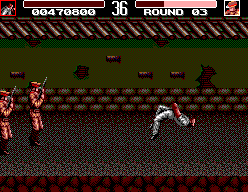 The Famicom game based on the The General's Son license was instead a typical 1-on-1 fighting game, so quite naturally, it has even less to do with the movie than the belt scroller. 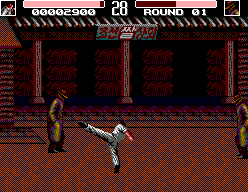 Like with most 8-bit fighting games, the programmers had troubles to mimick the tight controls of a Street Fighter II, so they went with a more simplistic approach to the moveset. 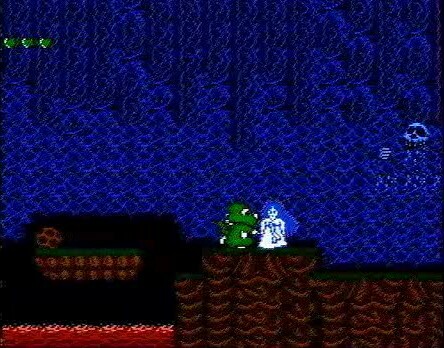 That didn't help much to compensate for the choppy animations, non-transparent priorities and ridiculous hit zones, though. 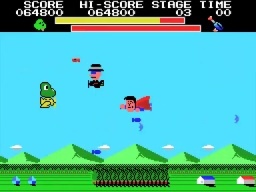 This version got the same treatment for the US market as the Master System game, but once again only prototypes survive6.